Al Qaeda doesn’t care about borders. Neither does the Islamic State or Boko Haram. Brigadier General Donald Bolduc thinks the same way. 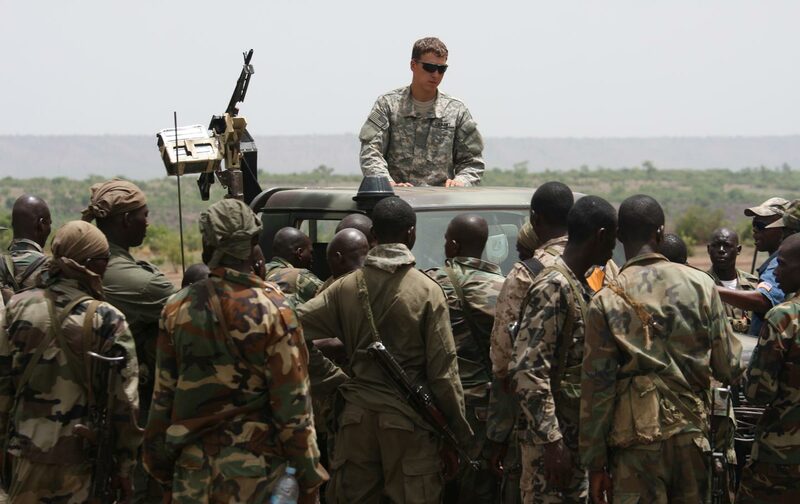 A SOCAFRICA planning document obtained by TomDispatch offers a window onto the scope of these “multi-national, collective actions” carried out by America’s most elite troops in Africa. The declassified but heavily redacted secret report, covering the years 2012–2017 and acquired via the Freedom of Information Act (FOIA), details nearly 20 programs and activities—from training exercises to security cooperation engagements—utilized by SOCAFRICA across the continent. This wide array of low-profile missions, in addition to named operations and quasi-wars, attests to the growing influence and sprawling nature of US Special Operations forces (SOF) in Africa. How US military engagement will proceed under the Trump administration remains to be seen. The president-elect has said or tweeted little about Africa in recent years (aside from long trading in baseless claims that the current president was born there). Given his choice for national security adviser, Michael Flynn—a former director of intelligence for Joint Special Operations Command who believes that the United States is in a “world war” with Islamic militants—there is good reason to believe that Special Operations Command Africa will continue its border-busting missions across that continent. That, in turn, means that Africa is likely to remain crucial to America’s nameless global war on terror. Publicly, the command claims that it conducts its operations to “promote regional stability and prosperity,” while Bolduc emphasizes that its missions are geared toward serving the needs of African allies. The FOIA files make clear, however, that US interests are the command’s principal and primary concern—a policy in keeping with the America First mindset and mandate of incoming commander-in-chief Donald J. Trump—and that support to “partner nations” is prioritized to suit American, not African, needs and policy goals. Earlier this month, in fact, a White House report made it clear, for instance, that “the United States is currently using military force” in Somalia. At about the same moment, The New York Times revealed an imminent Obama administration plan to deem al-Shabab “to be part of the armed conflict that Congress authorized against the perpetrators of the Sept. 11, 2001, terrorist attacks, according to senior American officials,” strengthening President-elect Donald Trump’s authority to carry out missions there in 2017 and beyond. Obama’s war powers letter also mentioned American deployments in Cameroon, Djibouti, and Niger, efforts aimed at countering Joseph Kony’s murderous Lord’s Resistance Army (LRA) in Central Africa, a long-running mission by military observers in Egypt, and a continuing deployment of forces supporting “the security of U.S. citizens and property” in rapidly deteriorating South Sudan. The president offered only two sentences on US military activities in Libya, although a long-running special ops and drone campaign there has been joined by a full-scale American air war, dubbed Operation Odyssey Lightning, against Islamic State militants, especially those in the city of Sirte. Since August 1, in fact, the United States has carried out nearly 500 air strikes in Libya, according to figures supplied by US Africa Command (AFRICOM). Odyssey Lightning is, in fact, no outlier. While the “primary named operations” involving America’s elite forces in Africa have been redacted from the declassified secret files in TomDispatch’s possession, a November 2015 briefing by Bolduc, obtained via a separate FOIA request, reveals that his command was then involved in seven such operations on the continent. These likely included at least some of the following: Enduring Freedom-Horn of Africa, Octave Shield, and/or Juniper Garret, all aimed at East Africa; New Normal, an effort to secure US embassies and assets around the continent; Juniper Micron, a US-backed French and African mission to stabilize Mali (following a 2012 coup there by a US-trained officer and the chaos that followed); Observant Compass, the long-running effort to decimate the Lord’s Resistance Army (which recently retired AFRICOM chief General David Rodriguez derided as expensive and strategically unimportant); and Juniper Shield, a wide-ranging effort (formerly known as Operation Enduring Freedom—Trans Sahara) aimed at Algeria, Burkina Faso, Morocco, Tunisia, Chad, Mali, Mauritania, Niger, Nigeria, and Senegal. A 2015 briefing document by SOCAFRICA’s parent unit, US Special Operations Command (SOCOM), also lists an ongoing “gray zone” conflict in Uganda. On any given day, between 1,500 and 1,700 American special operators and support personnel are deployed somewhere on the continent. Over the course of a year they conduct missions in more than 20 countries. According to Bolduc’s November 2015 briefing, Special Operations Command Africa carries out 78 separate “mission sets.” These include activities that range from enhancing “partner capability and capacity” to the sharing of intelligence. Such exercises are, however, just a small part of the SOCAFRICA story. Joint Combined Exchange Training (JCET) missions are a larger one. Officially authorized to enable US special operators to “practice skills needed to conduct a variety of missions, including foreign internal defense, unconventional warfare, and counterterrorism,” JCETs actually serve as a backdoor method of expanding US military influence and contacts in Africa, since they allow for “incidental-training benefits” to “accrue to the foreign friendly forces at no cost.” As a result, JCETs play an important role in forging and sustaining military relationships across the continent. Just how many of these missions the U.S. conducts in Africa is apparently unknown—even to the military commands involved. As TomDispatch reported earlier this year, according to SOCOM, the United States conducted 19 JCETs in 2012, 20 in 2013, and 20, again, in 2014. AFRICOM, however, claims that there were nine JCETs in 2012, 18 in 2013, and 26 in 2014. Special Operations Command Africa also utilizes an almost mind-numbing panoply of “security cooperation programs” and other training activities including Section 1207(n) (also known as the Transitional Authorities for East Africa and Yemen, which provides equipment, training, and other aid to the militaries of Djibouti, Ethiopia, Kenya, and Yemen “to conduct counter-terrorism operations against al-Qaeda, al-Qaeda affiliates, and al-Shabab” and “enhance the capacity of national military forces participating in the African Union Mission in Somalia”); the Global Security Contingency Fund (designed to enhance the “capabilities of a country’s national military forces, and other national security forces that conduct border and maritime security, internal defense, and counterterrorism operations”); the Partnership for Regional East Africa Counterterrorism (or PREACT, designed to build counterterror capacities and foster military and law enforcement efforts in East African countries, including Djibouti, Ethiopia, Kenya, Somalia, Tanzania, and Uganda); and, among others, the Trans-Sahel Counterterrorism Partnership, the Global Peace Operations Initiative, the Special Operations to Combat Terrorism, the Combatting Terrorism Fellowship, and another known as Counter-Narcotic Terrorism. Like Africa’s terror groups and Bolduc’s special ops troops, the almost 20 initiatives utilized by SOCAFRICA—a sprawling mass of programs that overlie and intersect with each other—have a border-busting quality to them. What they don’t have is clear records of success. A 2013 RAND Corporation analysis called such capacity-building programs “a tangled web, with holes, overlaps, and confusions.” A 2014 RAND study analyzing U.S. security cooperation (SC) found that there “was no statistically significant correlation between SC and change in countries’ fragility in Africa or the Middle East.” A 2016 RAND report on “defense institution building” in Africa noted a “poor understanding of partner interests” by the US military. The 2012 SOCAFRICA strategic planning document obtained by TomDispatch reveals, however, that Special Operations Command Africa’s primary aim is not fostering African development, governance, or military professionalization. “SOCAFRICA’s foremost objective is the prevention of an attack against America or American interests,” according to the declassified secret report. In other words, a “foreign agenda,” not the needs of African partner nations, is what’s driving the elite force’s border-busting missions. Special Operations Command spokesman Ken McGraw cautioned that because SOCAFRICA and AFRICOM have both changed commanders since the 2012 document was issued, it was likely out of date. “I recommend you contact SOCAFRICA,” he advised. That command failed to respond to multiple requests for information or comment. There are, however, no indications that it has actually altered its “foremost objective,” while Bolduc’s public comments suggest that the US military’s engagement in the region is going strong. In reality, however, oceans and distance have kept most Americans safe from terrorist organizations like AQIM and Boko Haram. The same cannot be said for those who live in the nations menaced by these groups. In Africa, terrorist organizations and attacks have spiked alongside the increase in US Special Operations missions there. In 2006, the percentage of forward-stationed special operators on the continent hovered at 1 percent of total globally deployed SOF forces. By 2014, that number had hit 10 percent—a jump of 900 percent in less than a decade. During that same span, according to information from the National Consortium for the Study of Terrorism and Responses to Terrorism at the University of Maryland, terror incidents in Africa increased precipitously—from just over 100 per year to nearly 2,400 annually. During the same period, the number of transnational terrorist organizations and illicit groups operating on the continent jumped from one to, according to Bolduc’s reckoning, nearly 50. Correlation may not equal causation, but SOCAFRICA’s efforts have coincided with significantly worsening terrorist violence and the growth and spread of terror groups. And it shouldn’t be a surprise. While Bolduc publicly talks up the needs of African nations, his border-busting commandos operate under a distinctive America-first mandate and a mindset firmly in keeping with that of the incoming commander-in chief. “My foreign policy will always put the interests of the American people and American security above all else. It has to be first,” Donald Trump said earlier this year in a major foreign policy speech. Kicking off his victory tour earlier this month, the president-elect echoed this theme. “From now on, it’s going to be America first. Okay? America first. We’re going to put ourselves first,” he told a crowd in Cincinnati, Ohio.